[Operation System & Advanced Configuration] Featured with the Latest Android 7.1 Marshmallow system which is more stable than Android 6.0 OS. 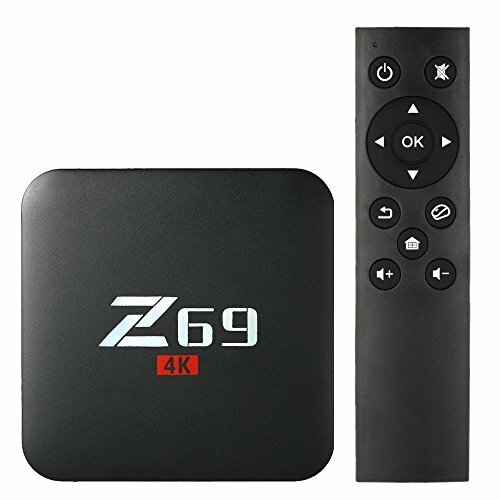 Powered by Amlogic S905X Quad-core CPU, including Penta-Core ARM Mali-450 GPU, advanced configuration is more than 4 times performance than other TV Box. [Memory & Expandable Storage] This mainstream processor comes with 3GB DDR3, 32GB EMMC Flash ultimately delivering a richer using experience which makes home entertainment become easy. 64GB expandable storage spare much space for your entertainment. [H.265 High Efficiency Video Coding] TV Box Bandwidth saving lifting speed H.265 hardware decoding can save 50% bandwidth resources, enjoy 4K movie smoothly which is 4 times of full HD 1080P. [Wireless Connection & Multi-language] It supports 2.4G WiFi, 100M which enhances stable transmission efficiency and strong transmission signal and Bluetooth 4.0 module allows connection with your BT speakers, keyboard and mouse. What's more, it supports multi-languages like English, French, German, Spanish, Italian, etc.